Congratulations to YMCMB rapper Tyga and his longtime girlfriend - Blac Chyna (of KOD) who has given birth to a beautiful baby boy. The couple announced it on twitter moments ago and Tyga even uploaded a pic via his instagram. Thank you God Always.Todaysgonna be a good Day. Welcome King Cairo Stevenson 7lbs 1 oz ....... #blessed !!!! 40 long weeks .... So happy words can't explain !!! 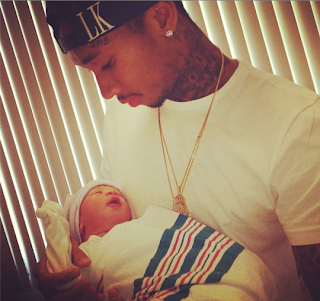 Tyga and Chyna named their son King Cairo Stevenson I for one cannot wait to see who he grows up to look like.